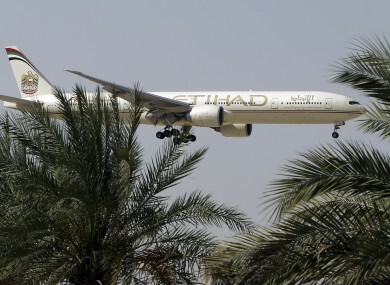 A MAN HAS been arrested after an incident on a flight into Dublin from Abu Dhabi. This happened on board an Etihad plane that landed shortly after 2pm this afternoon. The incident arose when around four hours into the flight a 31-year-old passenger began to act in an unruly manner. It is understood that he was intoxicated and was given a number of warnings. After these were not obeyed, one passenger who was on board the flight told TheJournal.ie that it took a number of staff as well as some male passengers to restrain the man. He was brought to the back of the plane and had his legs and arms handcuffed. He then proceeded to shout the word ‘bomb’ repeatedly. Gardaí were on hand when the plane arrived in Dublin Airport, arresting the man and bringing him to Raheny Garda Station. Email “Man who shouted 'bomb' on flight arrested at Dublin Airport”. Feedback on “Man who shouted 'bomb' on flight arrested at Dublin Airport”.